Wardrobe staples, aka a phrase that will help you to justify buying yet another knitted jumper, or in this case, biker jacket! Last week I shared some of my favourite slogan t-shirts (catch up on that post here) and lots of you said you liked this kind of post, so lets make it a regular gig shall we? Next to slogan tees, the next item of clothing that takes up the majority of my wardrobe is biker jackets. I love them, always have, always will and I am all for every single shop bringing them out in all of these mad colours. 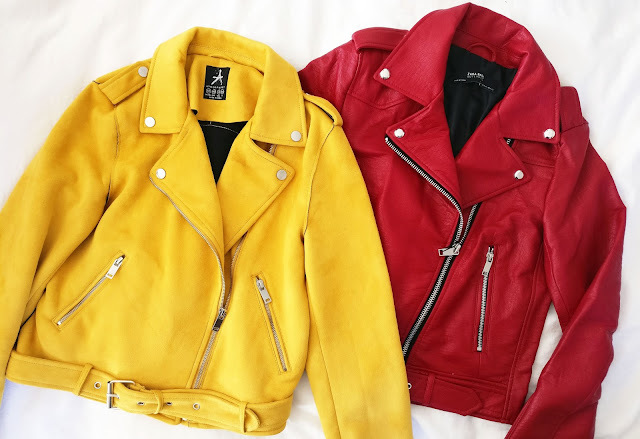 The yellow biker in the picture above is from Penneys and was only €28, and the red faux leather biker is from Zara and is still pretty reasonable at just €50. Biker jackets are a brilliant statement piece, especially if it's a colourful one like some of the ones I have linked below. They instantly transform an outfit and add that air of badass biker chic that I only wish I gave off naturally! Most of the time I pair mine with a striped or slogan t-shirt, a pair of jeans and Converse and even though it's a very casual outfit, the biker jacket gives a bit more interest to it. Below is an Instagram example of how I style my biker jackets. I'm wearing the grey version of the €28 faux suede biker jacket from Penneys and I also have it in pink too because when I love something I can't help buying it in every colour possible! Like I mentioned above, pretty much every single shop have some kind of biker jacket offering these days so there are lots to choose from. While I love how inexpensive the faux suede bikers are, I do have my eye on a few real suede ones from ASOS and also from Blank NYC which cost around the €150 mark, which is actually fairly reasonable as I have seen some real suede jackets costing upwards of €300! I've rounded up some of my current favourite biker jackets below (you can click on the images to shop), so if you're on the hunt for the perfect one, hopefully I've made the search that bit easier! I've also tried to included lots of different price ranges and some of the jackets from the likes of Pull & Bear and Pretty Little Thing are very inexpensive! Are you loving the biker jacket trend? What colours have you picked them up in? I'm seriously considering getting a blue one next time! Thanks so much for reading.